My stylist Jennifer was amazing! I only see Jenny, she is a color master. Jennifer is amazing. I have really thin, lifeless hair and she made it absolutely gorgeous in a way that I can nearly duplicate on my own lol. I get my hair cut about once a month from Jennifer and she is superb. I am so happy to have found this salon and my stylist Jennifer. 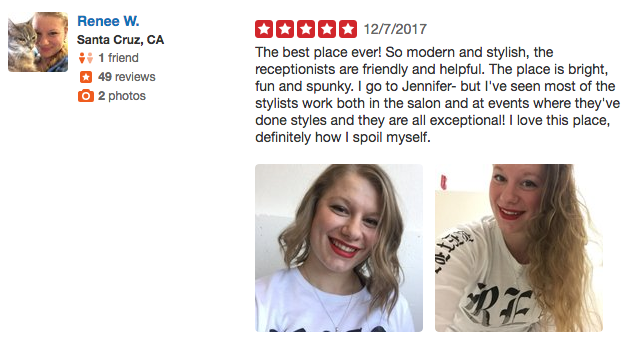 I go to Jennifer ... they are all exceptional! I love this place, definitely how I spoil myself. Had a color transformation with Jenny B yesterday and she's fantastic! My stylist Jennifer and all the other stylists and staff are over the top fantastic. Jennifer always goes above and beyond to create magic with my hair with a few pieces here, some extra color there. I booked an appointment with Jennifer yesterday and I am extremely happy about my haircut! I stumbled upon Jennifer's IG and one of her posts was a gorgeous image of her sister with rainbow colors in her hair. Happy 6 year anniversary Jennifer!!!! @jennyfakeig Thank you for your beautiful work and being a part of our team!!! Xoxo Umbrella! "I LOVE THIS PLACE! JENNIFER DID AN AMAZING JOB WITH MY HAIR"
My hairdressers were Jennifer and her assistant Jenna. Both girls gave world class service from the moment I walked in till the end.